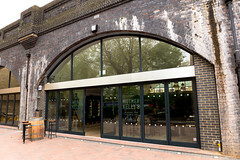 A bar styling itself "Tap Room and Bottle Shop" under a railway arch in Bethnal Green, a short walk from Bethnal Green Station. The space is light and airy with an industrial-chic look and colourful graffiti mural photo that makes it feel like some urban US bars. This impression is only helped by the long trestle tables decorated with flowers and bottles of both still and sparkling water that can be replenished from the end of the bar at any time. There are about 10 of these tables inside, with further ones outside to match. The arches are on a quiet stretch of Paradise Row, removed from the main road and overlooking the corner of Paradise Gardens. The bar has a stainless steel bar back with 23 unlabelled keg taps on it, somewhat in style of the Euston Tap, though even more minimal. Paper menus on the bar and all the tables list what's on, and it's a constantly changing variety of independent beers from all over the world. When Ewan visited in April 2014, there were seven taps dedicated to Dutch brewery De Molen (they do occasional tap takeovers by various breweries), one for a Brooklyn ale, a couple for German lagers, one dispensing Sleeman's Honey Brown Lager, and others with British beers from Siren, Kernel and Otley. On subsequent visits, this kind of range has been the standard. The standard drinks measure is a two-thirds pint, making the prices look fairly reasonable (most at around £3.50-£4), with the only pint listed as their bog standard Alhambra pilsner (£4.50/pint). The final four taps have one cider (Mortimer's Orchard Cider, £2.70/two-thirds on my visit) and one for a prosecco (£4 for 175ml), pinot grigio and cabernet merlot wine (each £3 for 175ml). The other part of their named offering are the bottles which can be bought for takeaway or consumption in house. Along one wall are arrayed four or five large fridge units with a variety of bottled beers photo, including a selection of German and Belgian beers, some from the United States and other countries, and of course plenty from around the UK and especially London, focusing on what has become known as 'craft beer' producers (generally small, independent breweries). There's a selection of bar snack food offered, including olives and cheeses, as well as a cheese board (good size and top quality cheeses for £8), and a charcuterie meat board. Ewan's verdict: This style of bar obviously won't appeal to all drinkers, but I found it to be a very pleasant and friendly place to meet friends for a drink, even on a Friday evening (perhaps it will only get busier in the future), while the focus on smaller measures and the ready availability of water meant that even after quite a few, I was still feeling refreshed the next day. Last visited by Ewan, June 2015. Opening hours taken from Twitter feed, April 2014. Last edited 2015-06-17 12:23:09 (version 5; diff). List all versions. Page last edited 2015-06-17 12:23:09 (version 5).